IDAHO FALLS – Industrial hydrogen is closer to being produced more efficiently, thanks to findings outlined in a new paper published by Idaho National Laboratory researchers. In the paper, Dr. Dong Ding and his colleagues detailed advances in the production of hydrogen, which is used in oil refining, petrochemical manufacturing and as an eco-friendly fuel for transportation. The researchers demonstrated high-performance electrochemical hydrogen production at a lower temperature than had been possible before. This was due to a key advance: a ceramic steam electrode that self-assembles from a woven mat. 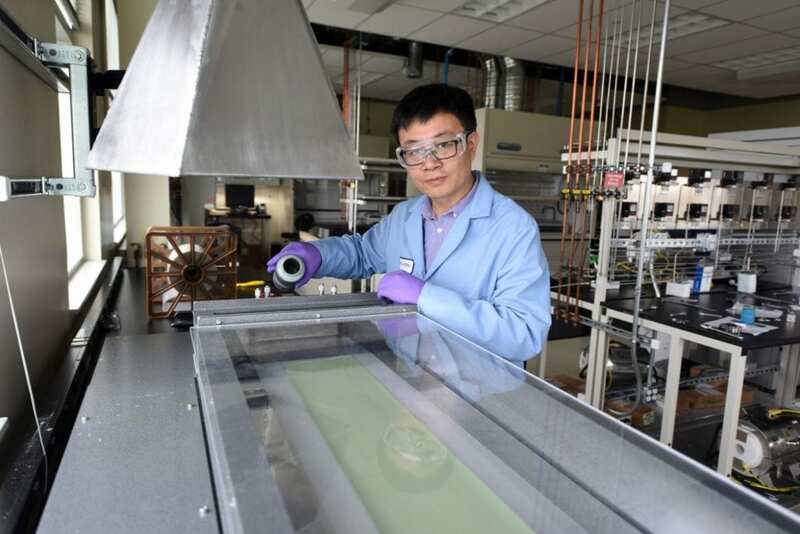 "We invented a 3D self-assembled steam electrode which can be scalable," said Ding. "The ultrahigh porosity and the 3D structure can make the mass/charge transfer much better, so the performance was better." In a paper published by the journal Advanced Science (DOI: 10.1002/advs.201800360), the researchers reported on the design, fabrication and characterization of highly efficient proton-conducting solid oxide electrolysis cells (P-SOECs) with a novel 3D self-assembled steam electrode. The cells operated below 600o C. They produced hydrogen at a high sustained rate continuously for days during testing. Hydrogen is an eco-friendly fuel in part because when it burns, the result is water. However, there are no convenient suitable natural sources for pure hydrogen. Today, hydrogen is obtained by steam reforming (or "cracking") hydrocarbons, such as natural gas. This process, though, requires fossil fuels and creates carbon byproducts, which makes it less suited for sustainable production. Steam electrolysis, by contrast, needs only water and electricity to split water molecules, thereby generating hydrogen and oxygen. The electricity can come from any source, including wind, solar, nuclear and other emission-free sources. Being able to do electrolysis efficiently at as low a temperature as possible minimizes the energy needed. A P-SOEC has a porous steam electrode, a hydrogen electrode and a proton-conducting electrolyte. When voltage is applied, steam travels through the porous steam electrode and turns into oxygen and hydrogen at the electrolyte boundary. Due to differing charges, the two gases separate and are collected at their respective electrodes. So, the construction of the porous steam electrode is critical, which is why the researchers used an innovative way to make it. They started with a woven textile template, put it into a precursor solution containing elements they wanted to use, and then fired it to remove the fabric and leave behind the ceramic. The result was a ceramic version of the original textile. They put the ceramic textile in the electrode and noticed that in operation, bridging occurred between strands. This should improve both mass and charge transfer and the stability of the electrode, according to Dr. Wei Wu, the primary contributor to this work. The electrode and the use of proton conduction enabled high hydrogen production below 600o C. That is cooler by hundreds of degrees than is the case with conventional high-temperature steam electrolysis methods. The lower temperature makes the hydrogen production process more durable, and also requires fewer costly, heat-resistant materials in the electrolysis cell. Although hydrogen is already used to power vehicles, for energy storage and as portable energy, this approach could offer a more efficient alternative for high-volume production.